Outside of Drew Hutchison and Jake Arrieta, this entire group are inducing whiffs well above MLB average. All of them outside of Collin McHugh, Yordano Ventura and Drew Hutchison also have an above average K-BB%. Drew Hutchison doesn’t have elite pitches, but his repertoire should ensure a 10+ swinging-strike%. When he is off, he will get shellacked at times (*update: hence Sunday’s start). Ventura’s velocity and Curve will ensure weak contact. Matt Shoemaker has great command, but the velocity makes bad luck HR/FB ratios possible, which his first game depicted. Trevor Bauer has a fun, extensive repertoire. All his breaking balls were working for him in his first start. He’s command-of-his-repertoire away from being excellent. Arrieta must have had a ton of called strikes depicted by a 26% strikeout rate despite a 2.9% swinging-strike rate. I want to focus on Jacob deGrom, Carlos Carrasco and Shane Greene though. The Tigers are like the one in the three-way that gets the most satisfaction…not necessarily the most initial attention. Shane Greene excited me, and I will tell you why. It wasn’t his competition (Twins). It was his fastball. Last year, my big complaint on Greene was his fastball-related outcomes. According to Brooks PITCHf/x Tool, his Fourseamers and Sinkers only induced whiffs-per-swing less than 13% of the time. In his first start, his Sinkers were slightly better, but his Fourseams were significantly better (whiffed 40% of the time). If his secondary stuff and velocity remain effective, the Yankees and Diamondbacks will never let the Tigers in on their three-way again. Carlos Carrasco is awesome. 2014 said so. His Arsenal Score says so. His first start of 2015 sure said so: a 39 K-BB%; a 43.5% K-rate backed up by a 15% swinging-strike rate and 74% first-pitch strike rate. All his offspeed stuff was elite. In conjunction with the velocity, he will remain Kluber-esque. Matt Harvey day was awesome. Jacob deGrom day would have been almost as good if it wasn’t for one single mistake to Ryan Zimmerman in the first. Jacob deGrom does it all. He can work down and then elevate a 95 MPH up in the zone. More of the same could ensure a better infield flyball rate and BABIP this year. Between this, his command and the best starting pitcher release point consistency (FG+ required), deGrom’s fastball will continue having excellent outcomes. He was pinpoint as he was in 2014. Matt Harvey attacks the zone with impact and obvious velocity. 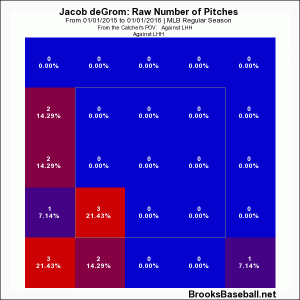 deGrom attacks with surprising velocity, command and deceptively consistent release points. Outside Carrasco, he’s the best pitcher in the embedded file above. I look forward to further verifying this list’s 2014 results. I’ll touch on Jake Odorizzi and Drew Pomeranz after another start or two. We hoped you liked reading First Starts Validating our New Studs by Daniel Schwartz! And the mistake deGrom made was over a foot inside! Zimmerman is just a freak on inside pitches. Actually it was perfect location (right where d’arnaud set up) – just a bad decision against Zimm who like you said and Jeff Sullivan wrote up, Zimm is a monster against inside fastballs. ha – came in to post exactly that. Thanks to Jeff Sullivan, we can see that the ‘mistake’ to Ryan Zimmerman wasn’t a mistake at all, it was almost a foot inside, which would have easily been a swinging strike to almost any other hitter. Yeah – I meant a decision mistake by him/TDA vs a location mistake. Even that was pinpoint!